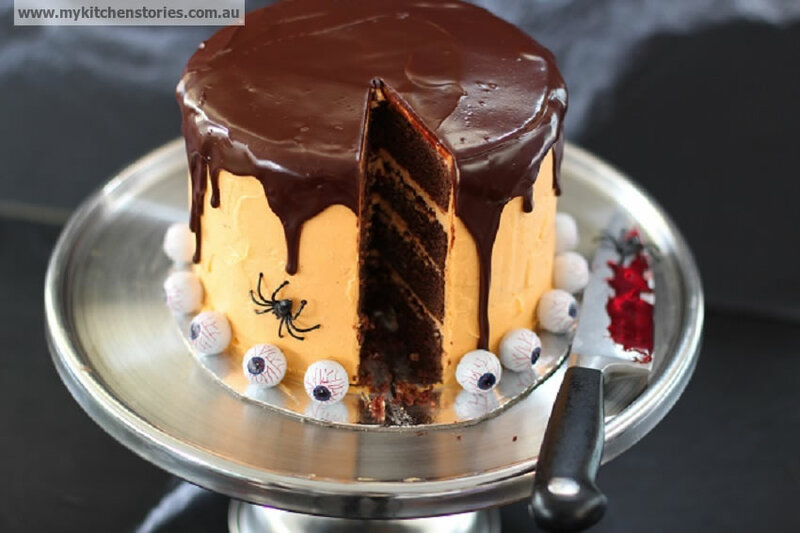 Chocolate cake Halloween style. This amazing cake is the perfect. 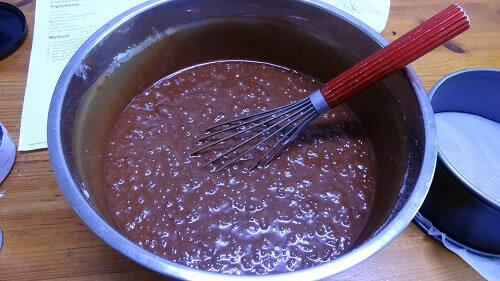 Its an easy stir together recipe that makes a moist chocolatey cake thats great for layering. Halloween has been extra big this year, already. 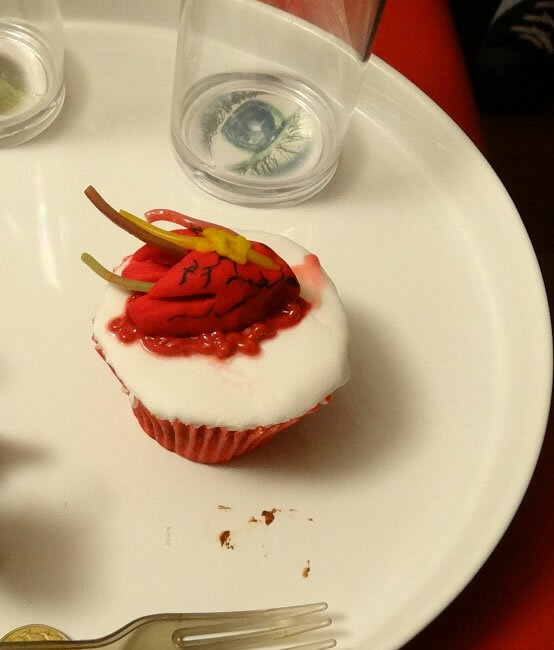 Not only have I been dressed as a Vampire at Not Quite Nigella’s annual Halloween party but this is my second Halloween themed cake. In Australia Halloween is still a bit new. I was surprised to hear an advert on the radio this morning for “last minute Halloween costumes for the whole family”. Halloween , you have arrived. 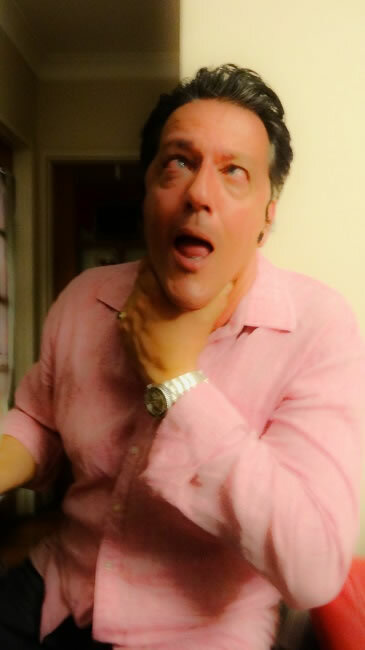 There are a lot of people resistant to the idea of another commercial opportunity to make money, but I just love the chance to play around with new recipes and have some fun dressing up. 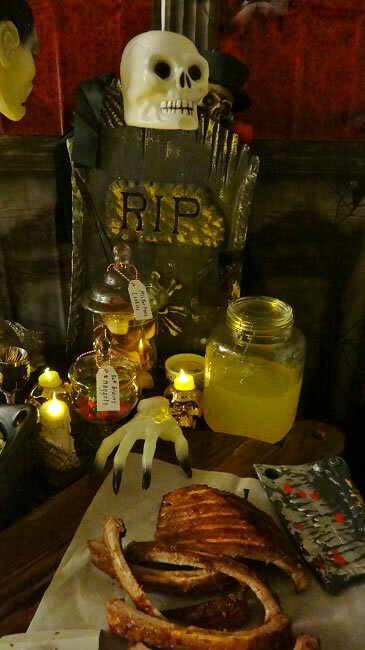 It’s not for everyone, but there are some very spooky recipes to be found. I first saw this cake on Country Living here. I made up my own recipe but follow whichever one you like if you want to make this spectacular cake. Put the first 5 ingredients into a medium pot big enough to hold all the ingredients, heat and stir till just melted. Take off the heat and cool. Once cool enough add the eggs straight into the pot and mix in well. Add the sifted flour and baking powder. Stir very well by hand with a whisk. Cool. Once cold cut off the rounded tops and split the cakes in half, making 4 equal rounds of cake . Beat the butter first till very light and fluffy. Add the vanilla and the cream cheese and beat again till light. Add the sifted sugar and then gradually the colouring till you get the colour you want. The icing should be fluffy and light. 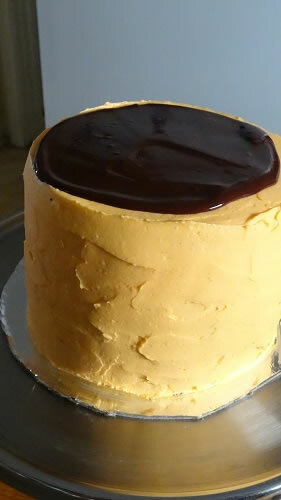 Finish the cake by spreading the remainder of the orange icing onto the outside . Chill overnight preferably but as long as possible. Cool this as it will melt the orange icing if it is too hot. When cooled pour about 1/2 onto the top of the cake and spread gently with a pallete knife, letting a bit at a time drip down the sides. Add a little more as necessary. The icing will set fast so dont take too long. Tap the cake from the base and the icing will start to smooth out. I love it Tania! Definitely fitting of the theme. 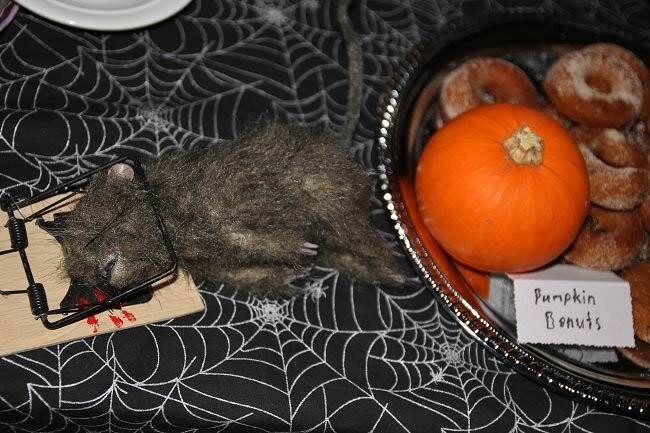 I think Halloween gets bigger here every year! 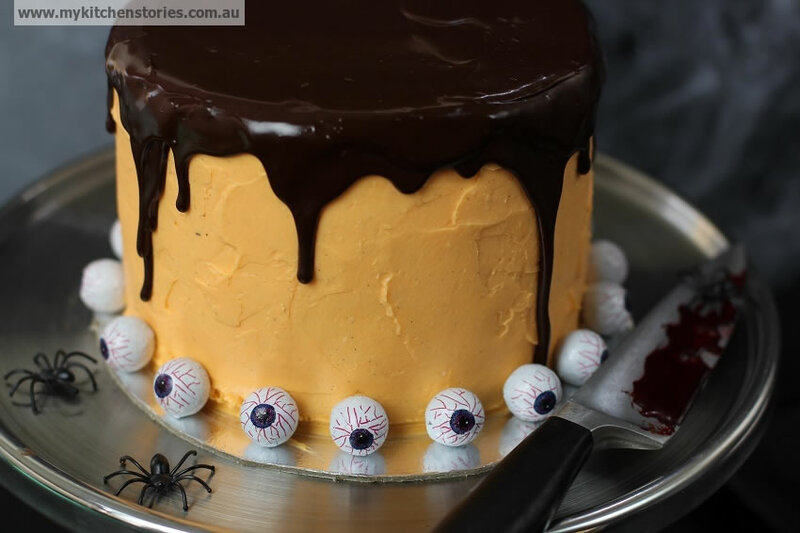 Love the eyeballs on the cake! G’day What a fun filled party indeed Tania, true! 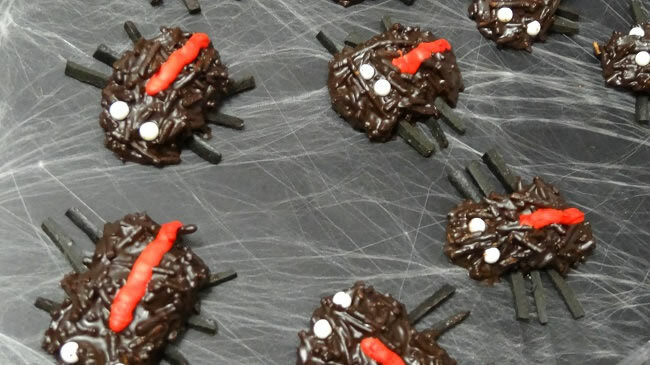 Love your spider and chocolate cake…eyeballs are haunting me now too! That cake is just so incredible. 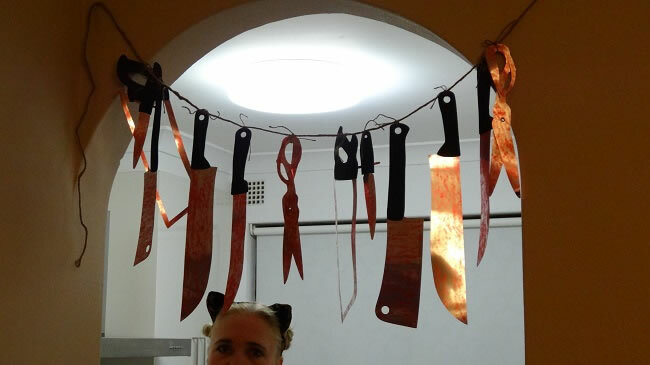 I love the eyeballs and blood on the knife. You are a genius. 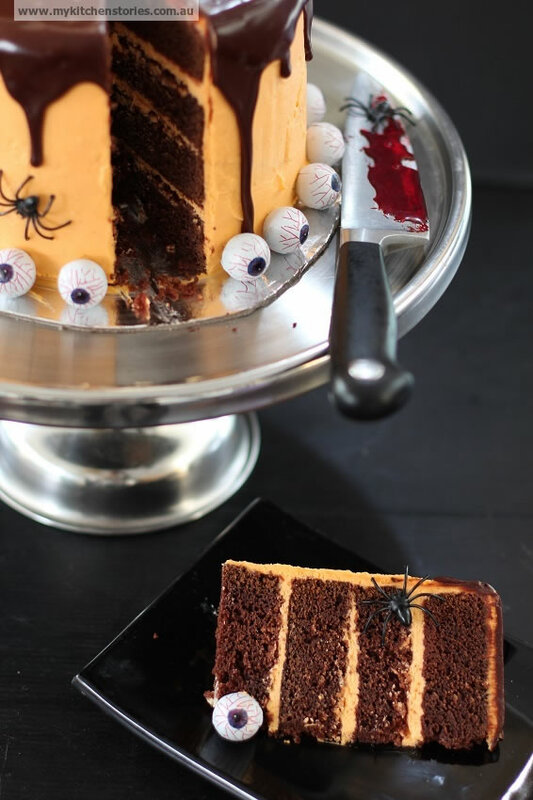 What a great post, filled with fiendishly creative ideas for Halloween! 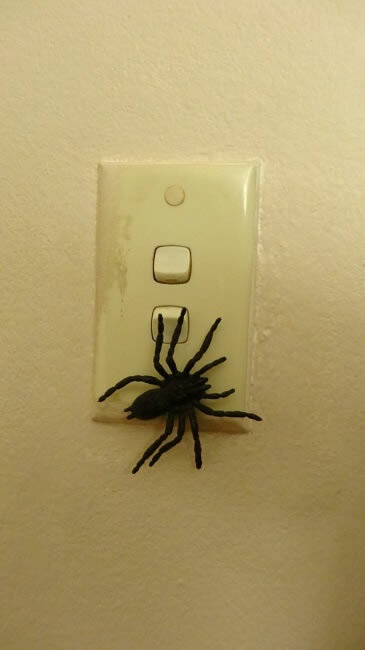 I can do without the spider on the light switch but love the eyeball-ringed cake. 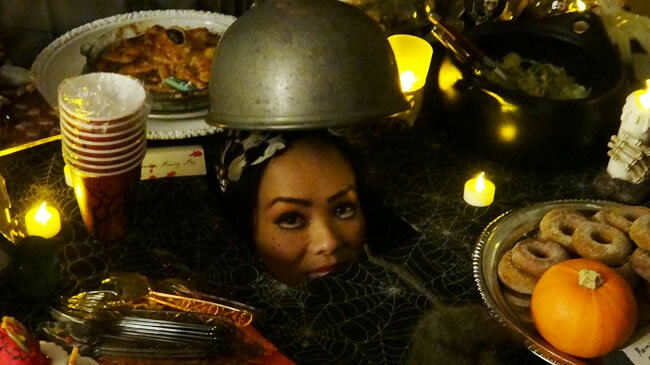 Have a happy Halloween, Tania! What a stunning layered cake! 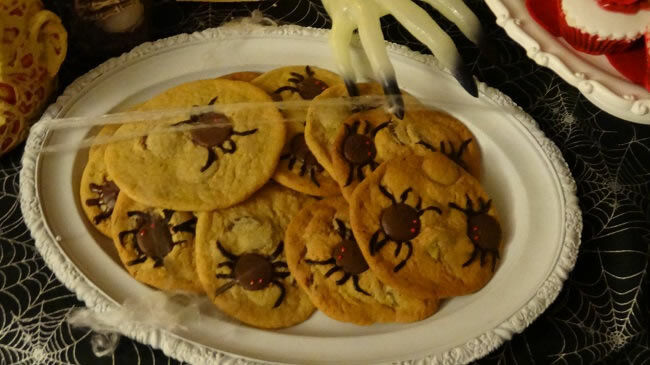 I also love thosespider cookies, Tania. Fabulous cake! 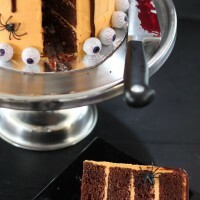 Love the eyeballs and the bloody knife. So cool! Lisa the Gourmet Wog recently posted..Crunchie Baked Kale Falafels. 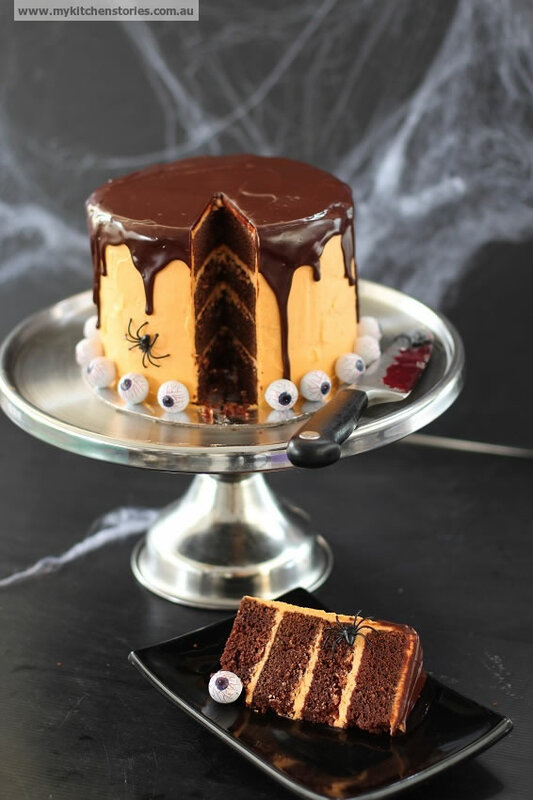 What a perfect Halloween cake! And wish I could have joined you at the party!!! !